New Delhi: The conjoined twins from Odisha — Jaga and Kalia — whose heads were separated on October 26 at the AIIMS here, continue to be in the ICU but their condition is stated to be stable. 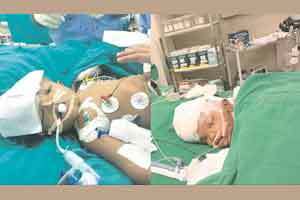 Dr A K Mahapatra, the chief of the neurosciences centre at the AIIMS said, the craniopagus conjoined twins from Kandhamal district are in the ICU and their condition is being monitored by a team of experts round the clock. Blood is being transfused in them and their condition is stable, the doctor told PTI. Dr Deepak Kumar Gupta, neurosurgeon at the AIIMS, who led the surgery along with Dr Mahapatra, said Jaga is on intermittent hemodialysis and his kidney functioning is improving. The two-years-five-months old twins were separated following a 16-hour-long surgery at the AIIMS here. A team of around 30 specialists from the institutes neurosurgery, neuro-anaesthesia and plastic surgery departments performed the marathon surgery. AIIMS Director Randeep Guleria had earlier said that though the twins have been separated, the next 18 days would be extremely critical to ascertain the success of the surgery. The team of doctors involved in the procedure also had expressed concern about the survival of one of the twins. The first phase of the surgery was performed on August 28 when the doctors created a venous bypass to separate the veins shared by the babies that return blood to the heart from the brain. The twins were admitted to AIIMS on July 13. Dr Deepak Gupta had earlier said the condition, which the twins suffered from, afflicted one in 30 lakh children, of which 50 percent die either at birth or within 24 hours. In this country, two similar surgeries had taken place earlier to separate twins joined at the head but were not successful as the children died during the procedure.